My soul has been your playground. I have and will share relentless details of semi-interesting anecdotes. There is simply no way to do without the convenience of seeing the caller id of an incoming call. No more not hearing the cell phone ringer. The only thing better would be display of text messages, but we've got to give geniuses as NASA (or Taiwan) some time. I also questions why a geek watch wouldn't be digital, but who cares? It's got Bluetooth. And Bluetooth gets the babes (I'm married, but I need to retain the adoration of my adorable wife - I'm not letting myself go, electronically at least). They call this one the lecture-killer. The car driver-killer. The attention killer. I can watch Oprah all the time. Civilization has hits its peak. Head for the hills and get a shotgun; it's only downhill from here. This is more of a diary type post that I'm just not sure of being of interest to even everyone sitting on this couch, so I'll start with a more fun story of what happens when cops write down "No Plate" for citing a car without a plate and you have a vanity plate of "NO PLATE." By the way, Snopes.com is the place to visit before you forward any desperate sounding e-mail. I woke up unusually early today (early enough to get a free parking spot on Anderson St. Free or illegal - the signs are confusing, but there are other cars parked there). I walked a little through Duke Gardens and then onto Campus. I feel the opposite of elitist there. A townie. I don't even know what they call a townie. No one is mean, yet.... Although OU's football team has national prominence, I don't think my Oklahoma degree stacks up favorably to Duke. Anyway, its price tag shows in the beautiful campus. Duke "Chapel" is more of a cathedrał, the kind that would be busy with tourists in Europe. Here people don't seem to notice. An iPod is more interesting than the organ. I wandered around into a student center. I don't know the name because building signs don't abound, excepting the somebody engineering school in the somebody building in the somebody center. Maybe the New York system, like PS # 15 would be easier. Again, I digress. I saw a sign for a blood drive. Donating blood has been on my to do list for 3 or so years. The Red Cross would call on the three past donors in our house frequently. But it never happened, even with a lot of free time. I tried in France, but just like we worry about potential donors spending too much time in Europe, they worried that I had not spent enough time in Europe. Today, I couldn't claim it was inconvenient, and I probably wouldn't faint, just get close. Dozens of IVs at Duke, and I still almost faint. Lying on the stretcher, I remembered blood drives at OU, a source of much of my T-shirt supply. That made me think of a campus ministry meeting more than 10 years ago. Melinda, a nursing student, told us that she and other nursing students were giving vaccine shots nearby. "Come on out - we really need the practice!" Um, we all really like you, but no. She is gone already. Things aren't as they should be. 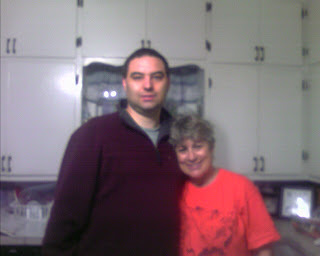 She was the first girl , married to the first guy, I can remember at OU. The nurse saw me squirming and asked if we I wanted something. Yes, please. Can we get an orange juice OVER HERE! Rang out across the room. I wanted to hide: don’t look at the ready to faint weak who needs orange juice. "Roy can't help because he's busy getting ready for the short bus." [the bus for special education kids] I wanted to stand up and say, "Us short bus people are proud!" But I was still in the stretcher and had a needle in my arm, so standing up would have been disastrous. The first part of my two bus trip to my magnet high school involved a short bus that was free at the moment. It had the handicapped symbol and the lift, and it added additional stigma onto going to the nerd school. Everyone was friendly, and I was called sweetie a lot. No T-shirt at the end, but did I really need another? Can you ever have too many T-shirts, given stains and the compelling need to avoid laundry cycles less than a month? To my shame, I have actually started to buy shirts. I am growing up. But I'm still cheap. The last purchase was 3 shirts for $10. It's Sunday night after night church. It's our only church - we don't get up early. (Not necessarily worth a blog post, I thought but the people who were there said it deserved commemoration. Concerning the horrid events last night post church at what was supposed to be a love feast at Tyler's. Trigger earns a fry-strong wrist band for not backing down on his fries to J--. Yet...). Not but an hour past a message of scarcity being a done thing at the communion homily, scarcity hit the fan at dinner. Let us take guidance from the witnesses of the past. The fundamental question is not are there enough fries? This is an etherial gnostic issue. The incarnate question is why were there not enough fries that night? The solution to the fries shortage, some puritans may say, is to sacrificest thou fries for another. But this misses the truth that more fries layeth 100 meters away in the kitchen, where an abundance of fries, rotting in the putrescent opulence of their unused quantity, just as the parable of the two barns predicteth. Petty fighting and stealing amongst the masses, a total breakdown in social order, imposition of mandatory tips, skirting the rules on splitting tabs doe large parties, near rioting - these are the results of rationing arbitrarily based on green pieces of paper or worse still paperless remuneration, a sign of the end times as sure as the Olsen twins reproducing. This leads certainly to the conclusion - the means of fry production belongs to the eatertariat! The masses must claim what is theirs. The them is us: Your insistence on paying off student loans, my insistance on not draining our 401k, certain women's insistence on wearing clothes other than those boughteth at the Costco, music fans who must pursue music made after 1998. Selah. We give the power to the beast by returning our riches unto his lair and bely the truth that scarcity is no longer amongst us. In the short term, fry stimulus may soften the shortage. However, only a benevolent, authoritarian state directly representing and controlling the masses can reprioritze the creation and distribution of fries to relieve this artificial fry shortage. Eaters of the world unite! The streets will flow with the ketchup of the non-believers! This is part of one an 1800 part series: the author embarrasses himself. This blog contains chemicals known to the State of California to cause cancer and birth defects or other reproductive harm. Side effects include dementia, explosive vomiting, and in extreme cases, death. Printing this blog will result in exposure to toner, a known carcinogen. OMB Political Disclosure: BE FRIGHTENED! This blog contains outlandish claims of imminent disaster if you don't do what I want. As such it will be evaluated by an Obama Catastrophe Czar, who may choose to award it the Threat Level 3000 award if it can be shown to scare the tar out of people, leaving them cowering in their highly leveraged houses, waiting to hear the next Obama announcement. NC Cost Disclosure: 57,000 copies of this blog were prepared at a cost of $0.04 per announcement to the taxpayer. 36,994 copies were lost in a violent incident involving a goat and a shredder. Another 20,000 copies were lost when we stored them in the dumpster, which led dumpster divers to believe they were free organic toilet paper. "It hurts, so it's green." 16 goats were slaughtered as part of our preprint rituals at a cost of $0.90 per announcement. Those receiving kosher posts cost an extra $0.03 per announcement. NC state residents should send a check for 7.75% of these amounts to the state Treasurer. Safe harbor statement: This release includes forward-looking statements intended to qualify for the safe harbor from liability established by the Private Securities Litigation Reform Act of 1995. It is thus 28% safer than blogs without this information. IRS requirement: Reading this blog may require an amortization of viewing expenses accelerated at a 5 to 1 ratio if viewing began before Aug 7, 1934. Viewing beginning after that time may require an amortization rate of 3.7. Use form 109-blog to calculate your calculations. See subsection C for more important details. Subsection C will be published July 1, 2010. Estimate the effects of subsection C using form 109-C-temp as you will be liable for all charges at the end of the current tax year. Substantial penalties for early withdrawal. Another State of CA disclosure: This blog contains products know to the state of California to cause cancer. Wearing sunglasses or standing on one leg may mitigate this risk. FDA disclosure: This blog is not intended to diagnose, treat, cure, or prevent any disease. However, it really really works. Sham-wow! away your ear wax. PETA disclosure: The goats (or mountain kittens) killed above were really mean, almost evil. They had it coming. Patriotism disclosure: This blog is not now, nor has it ever been, a member of the communist party. This disclosure cannot be disclosed, and we can't say why. fatigue or hyperactiveness, extreme hair growth or loss, sterility, hyper-fertility, mild brain damage, or death. Organic statement: This blog has been published using fresh, free-range, cruelty-free, ionized Heisenberg brand electrons. Medicinal Announcement: Certain medicines may reduce your ability to safely read this blog. If it takes more than 4 hours to read this blog, talk to your doctor. The trip is over, and one week later I can now climb steps without pain. Before I regretted having stepped onto the gas pump island instead of going around it. The trip went well, the Grand Canyon was great, but I am ready to be home. A link to a Google map of the journey is below. Going west is flying. East is driving. It counts 5100 miles in 7 days. Let's compare that to a normal day: stay at home and a maybe a car ride to McDonald’s and maybe a few minute walk if I'm motivated. I enjoyed the trip, but much recuperation lies ahead. Normally eight hours of driving plus stops wouldn't be a big deal. But after 6 days of averaging over 8 hours/day of traveling, I was a little worried. I don't remember doing more than 8 hours of driving alone since 1999, when I drove back to college in Oklahoma from a summer job in Minnesota. I took I-75 to 81 to 77 through Tennessee instead of the West Virginia I-64 route because I had been through West Virginia many times while going to Indiana and I was tired of the steep mountains and tolls. It was different with beautiful mountains, but at some point, the mountains become like the fields of Kansas and deserts of Arizona: more of the same. By dinner I was ready to be done and not ready for road food. I saw a Super Walmart, pulled off the interstate, and scavenged for quick but not fast food. A memory bloomed. That new Walmart in Texas was in the news for Sushi. Suddenly I craved sushi. I’m not high class enough to worry that it’s Walmart sushi. It’s not to be found in rural Virginia. Next best choice: yogurt with mix-in oatmeal, tapioca pudding, orange juice, and a box of Kix to snack on. Sorry for all of the crushed Kix in front of the driver’s seat. My Kix accuracy was less than stellar. On the other hand, if you had the amenities that Avis had for the same price, like cruise control and XM radio, I might have taken the trip more quickly and avoided a hasty, ill-conceived Walmart meal. No cruise control! For shame. I arrived in Durham at 10 PM. It was very good to be home. The next morning I relaxed and dawdled until I realized at 11:50 that the rental car was due. I arrived right at Noon, when it was due. I walked across the street to the bus, which goes downtown and then out our way. This is the only bus route I know because I used it once before to see Toy Story at the mall. It’s strange how random ideas (did I really have to see Toy Story when I was without a car? Yes, it was in 3D and could leave theaters at any time). That’s why some tech companies allocate time for employees to work on weird ideas - you never know what useful information it may bring. Happy to be back. More stories soon about cereal for dinner and a third-world rental car on the way back. Lara is happy I'm back too, as are at least on of the kitties. Kansas is like Indiana, only more so. trip the next day lacking in home-cooked goodness amongst fast food. for a walk, and things played out like we expected, on the sidewalk. case of cheap beer in a freshman dorm room. wrapped in pumpkin bread worked well. Score one for the pumpkin bread. I had a little bit using a plastic spoon to scoop it out before sleeping. bags won't stop Cameron the Hungry. I rushed to the car. It was gone. No bags or crumbs even. barn has burned to the ground, I can see the stars. much. It's like asking the genie for more wishes. is officially back in the East. outdoor seating, so we didn't have to sit on the curb with the dog. like a pizza stone in reverse. watching traffic makes her unhappy. We arrived at Lisa's parents. I'm renting a car and driving back tomorrow to some changes in circumstance that are preventing a fun weekend in Kentucky. 2018 est mile 21 east of Louisville on I 64. You can't speed through. 2 mph so everybody sees you. Ugh.construction . One way to (not) fix a door lock that doesn't work. Tucumcari to St John passes through NM,TX,OK, and KS with no interstates. It's not necessary. There are stop lights, but it feels like and interstate because there so few cross streets. Most towns we passed were a few blocks long, smaller than the Phoenix airport. parts lacking. But there are still plenty of wonderful people. We toured the main square, seeing where Vicki's Aunt Vida has owned a building (here name is still there) and where Vicki's sister works. There were not street performs like Indian look-a-likes playing Celine Dion on a wooden flute (AmericaA few blocks away is here childhood home. 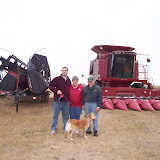 We met Vicki and her 95-day year old Dad at the grain bins. Where he showed us a tractor. Just the climb up into was a bit difficult to me, and I wasn't sure what I could hold onto amongst all of the gadgets in the John Deere. We headed back to their house, and we talked as Vicki finished an elaborate dinner with a family recipe mac and cheese, Priba in a Bowl™ named after iconic Oklahoma entertainer and accountant Kevin Priba, and Honeymoon Delight™, an ice cream dish wish I accidentally named in a PG-13 comment at our campus ministry. Yes my honeymoon was better than the cake, but with Lara as a good cook, I get it all. We had to say our goodbyes to head to Junction City, where we start a long leg to Kentucky tomorrow. We finally made it after a lot of NM,TX,OK,and KS driving. 8:15 leaving Tucumcari for St. John,KS! from the New Mexican dessert. interaction I have ever had. was a very good choice, as proved by the next few hours. death's door when I do intensive exercise. But the water was awesome. they did not work (although they were not labeled as such). elated that this isn't another trick. How often does the train come? So often you won't notice. More on that later. 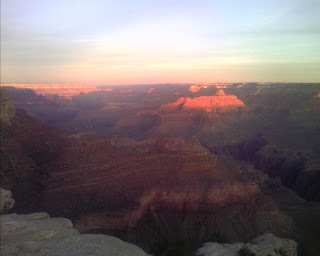 early tomorrow to see the Grand Canyon. getting up early, but it's the Grand Canyon! 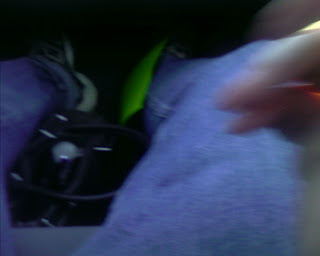 my lap (in the most decent manner possible - church lap). mind the signs saying not to attempt this under any circumstances). before driving to Albuquerque on Monday. So can this little jaunt by myself meet my expectations? memory is not that bad (for that time period anyway). We'll see. else. She is excited about moving back East. some cheap gloves (another thing I forgot) and 3 T-shirts for $9.99. emblazoned with a corporate logo. time is 24.45 hours after the rental time. triad. It is amazingly not busy with no waits at checkin or security. surfing. Either way, you are killing time. just start the trip at 4 am. 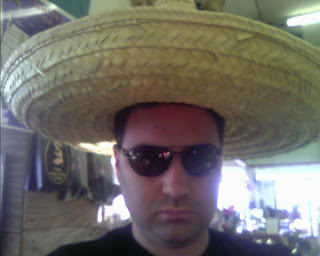 We now transition to a travel blog, featuring my trip to Phx to NM to KS to KY back to NC. I leave GSO around Noon Sat. This one is fresh to N NE Durham. Could this be a trend? "It's just like, it wants out. We're getting it out of here." It's weird that this logic doesn't get you arrested. It wasn't just a one drunken night, prank - it took several days over a few months and a lot of beer to get the dump truck out of the abandoned factory and onto the ground. According the article, "Detroit has 80,000 abandoned lots and buildings," and the police are busy enough with the ones that aren't abandoned, so it's kind of a tourist wasteland. Fortunately, a videographer was passing by. It's actually decent quality video. So what do you do with all of these abandoned buildings? Most cities eventually bulldoze blighted properties, but 80,000 is a big number. I actually stepped foot on Duke's East campus for the first time in 8 years. I forgot I my OU shirt was on, but I actually got a friendly comment.The transracial comment left me feeling less divided by the 3 foot wall surrounding the East campus. I saw a little girl climb on it - it's not really keeping anybody out. But it is still a divider that proclaims an us and a them - those that afford, somehow or another, to pay tuition that is more than "them" bring home in a year. Those that need tall Police contact poles and suggesting at those that make the poles necessary. 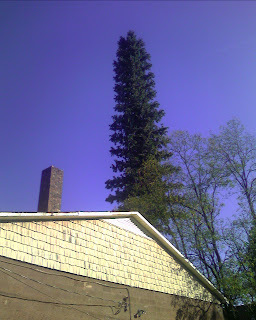 A Durham landmark: the cell phone tower / tree at Roxboro and Murrary Aves. 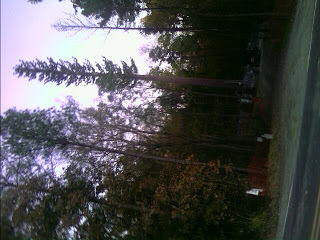 It looks better in this picture than a wider zoom, with one "tree" sticking out. See the usual stuff, like Duke Gardens, but don't miss this (failed) attempt to blend technology and nature. A map for those who want to trek to North Durahm is on Google Mapps on http://tinyurl.com/celltree . Satellite and street view just pick up a gravel lot - I guess they haven't captured the new tower yet. Before you can really listen to us at Turf Management Ethics: The Blog, we need to establish that we are Good People. 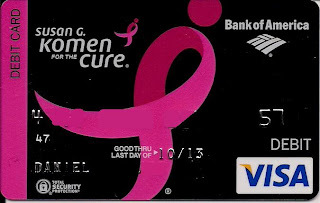 So here is an example of our ever-abiding love for all things good: A Susan G Komen Debit Card. What does that even mean? I called up the bank because they would give a little money to breast cancer research. But how do debit cards and breast cancer connect? I am not pro-breast cancer - a fact I repeated, under oath to the grand jury during my indictment. I have a friend who died from it, a friend who had a scare, and a friend who battled it and won. I overcame my squeamishness about buying a stamp with the word "breast" on it. I have supported products and walks and such. But the sheer proliferation of related products is amazing. The list of products is amazing, from pink lint rollers (thank your 3M), Huggies diapers, checks, a 5K walk on a cruise ship, a pink Kitchen Aid, and a renegade non-Komen-endorsed Snuggie. Maybe this is capitalism at its best, helping a little with every purchase. But couldn't we just give the money quietly with one hand and but what we need with another. Instead we end up with marriages not made in heaven, like the Pepsico Fitness Center on Duke's Campus. We are defined by our consumption - still conspicuous but now a littlemore auspicious, with our economic (or uneconomic) choices describing us as good or bad people. Thus we defy the idea that it's not what goes into us that counts; it is what comes out of us. If you use a PETA cobranded Visa to purchase a fair trade,organic, cruelty free soy latte in a 100% post consumer content, compostable cup made from wind power and carbon offsets from a company that advertizes its support of Venezuelan orphans, and you then insult the waiter and forget his tip, how good of a person are you? 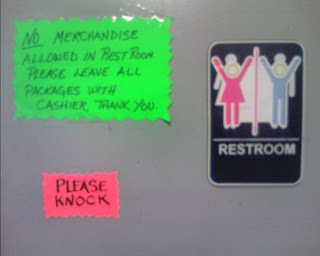 Whatever you learn from this blog, tip the waitress well. Brad taught me that in college, and it's stuck more than Calc IV (Gentle ladies close your ears: Calc IV don't stick to the ribs so well - it's just as likely to come back up as it to come down). Not that we can't purchase positively, but at some point, we are either declaring ourselves externally to be wonderful peope or we are justifying our shortcoming to ourselves. Try giving without the bumper sticker or taking off the bumper sticker after a few years.